While the previous node demonstrated trying things out with BlueJ's visual interface, this node will cover trying things out in code. It is often convenient to quickly try out code without having to put it into a whole program and compile it. However, since Java is a Compiled Language, it doesn't come with a built-in "tryer-outer". 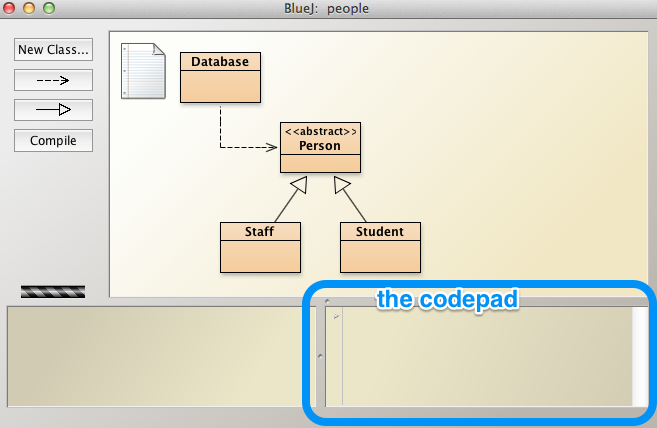 BlueJ solves this issue by providing a CodePad for this purpose. The codepad should be visible on the bottom right corner of BlueJ. If it isn't, click on View > Show Codepad. @Victoria, 1 to 50 only contains 26 odd numbers (see the hint). Thanks, I've got it now. I may well take up the offer of membership in future - I'll see how I get on for now.